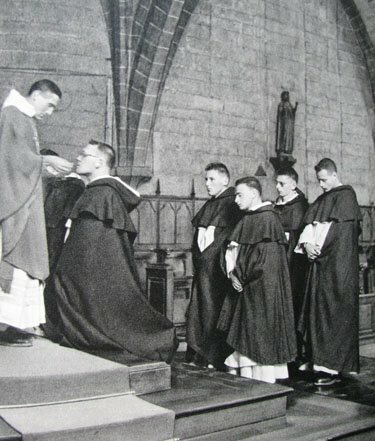 For 100 years, members of the Deserving Poor Boys’ Priesthood Association have helped young men answer the call of Jesus Christ to become Dominican priests—and earned a share in their divine works. Today, with over 70 men in formation, the Province of St. Joseph has the fastest growing men’s vocations program in the United States. With the help of generous donors, many of whom learned about the Association in their Dominican parishes, the Deserving Poor Boys’ Priesthood Association is answering the call of St. Dominic in the 21st century. Members make financial gifts as concrete expressions of spiritual dedication, “living stones,” set on the foundation laid by St. Dominic to build up a spiritual house capable of offering acceptable sacrifices to God. In 1928, the Association received official recognition from Pope Pius XI, who granted its members a plenary indulgence, under the usual conditions, to be gained annually and in the hour of death. By joining the Association, members can receive this indulgence and reap the spiritual benefit of masses and prayers offered by the priests of the Province of St. Joseph. Additionally, the faithful departed can be enrolled in the Deserving Poor Boys’ Purgatorian Society. For information on membership in the Association or enrollment of a departed loved one in the Purgatorian Society, click here.